Once you have determined the kinds of sprinkler heads you will need for your irrigation system, it’s time to sketch out their locations, as well as the locations of the pipes. For the best results, each area of your landscaping should have its own irrigation circuit, and some areas might need more than one. For the most efficient use of water, make sure to use the same type of sprinkler head with the same output on each circuit—in other words, don’t use shrub heads and rotors on the same circuit. 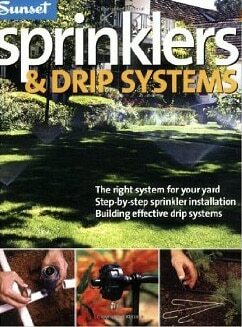 Keep your water source’s output in mind as you plan for the number of sprinkler heads. To ensure proper water pressure for each head, a circuit should not use more than 75 percent of the available water flow. For example, if your faucet has a flow rate of 16 gallons per minute (gpm), a circuit should not use more than 12 gpm. Look in the manufacturer’s instruction booklet to find the total output for a sprinkler head and then add the output of each head on the circuit to determine total output. Write down the output of each sprinkler head next to its location on your irrigation layout, and then assign as many heads as you can to each circuit. If you have a flow of 10 gpm at your faucet, for example, you could install 15 sprinklers that use .5 gpm each. If you find that you exceed the recommended flow rate for a circuit, switch some sprinkler heads to another circuit or divide the circuit into two. 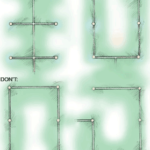 After you have your sprinklers arranged on each circuit, you will need to lay out the pipes that connect each circuit to the water source. Start with pipe extending from the main water source to the control valves. 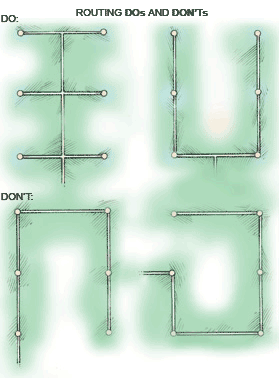 The layout of your pipes will determine the efficiency of each sprinkler head. Pipe that goes through the fewest number of sprinkler heads to reach the end sprinkler maintains the best water pressure and flow throughout the circuit. Conversely, the more sprinkler heads water must run through in a circuit to reach the last one, the poorer the water pressure and flow will be. When planning the layout of your pipes, avoid tree roots, driveways, and other paved surfaces. 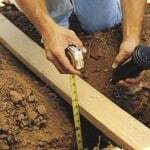 If you are laying pipe for a slope, lay as much horizontally as you can.